Axis Of Oversteer: Singapore GP Qualifying: Hamilton hammers, Vettel peaks too soon. 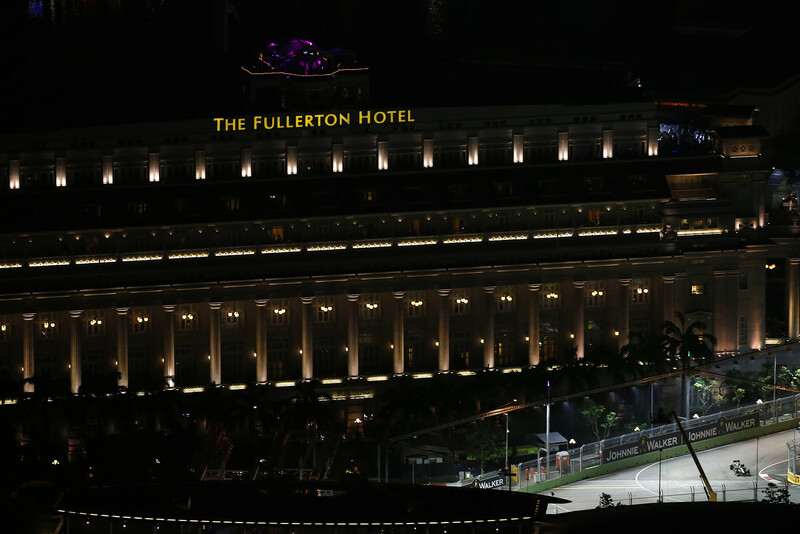 Singapore GP Qualifying: Hamilton hammers, Vettel peaks too soon. It's going to be a very interesting first lap tomorrow what with old friends Lewis Hamilton and Pastor Maldonado sharing the first row. Maldonado knows the stewards eyes will be on him but the margin of error here at Singapore is nothing. Pass the popcorn. Lurking behind is the other kid under surveillance, Romain Grosjean, call him "Lucky Luke" after stuffing his Lotus into the tire barriers in Q2 without any apparent damage. Speaking of hitting the wall, in Q3 Hamilton, apparently not content having essentially pulverized the field was on a final flier when he touched the wall with his right rear, will there be an issue in the race? Vettel could not match his Q2 pace in Q3, this after being the fastest guy in every practice session. His Q2 time would have put him on the front row ahead of Maldonado and his miracle lap but Sebastian made a mistake on his final attempt. Alonso is a whole second down but can afford to be, for Ferrari it will be a question of reliability, consistent race pace and tire wear. If he gets on the podium, it's a win. Unfortunately Alonso has to do all the work alone, Massa failed to make Q3, Barring a miracle in the race this will be his last Singapore GP. Raikkonen needed more ice cream. This will be a race of strategy, safety cars are likely and last year it was a 3 or 4 stop race. Pass more popcorn.